The hubby and I celebrated our 24th wedding anniversary a few weeks ago. Normally, you would think that necessitated a evening out in a dimly lit restaurant with a fancy dinner and exorbitantly priced wine. Truth be told, I am usually all over the super expensive restaurant experience. Banquette seating and thick napkins. Swoon. Michelin star? Got me. Celebrity owned? Sure! Thing is, none of those exist here in my small part of Upstate New York – Sigh. With no exciting options and after much deliberation, we decided on a super moist, crispy herbed spatchcocked chicken, with some shishito peppers and mushrooms. As it happens, that pairs really well with the 2010 Chassagne Montrachet we had hiding out in the cellar – lucky us. Next year? Nothing planned so far – but it is our 25th, so I have a feeling I will not be cooking. In the meantime place chicken breast side down and cut out the backbone with kitchen shears or a large knife, discard or save for another use such as homemade chicken stock. Sprinkle chicken all over with kosher salt. Place a large cast iron skillet over med/high heat, heat for a few minutes then add olive oil. Once oil is very hot and shimmering carefully add chicken breast side down. Cook undisturbed for 4-6 mins or until skin is nicely browned and crispy. Carefully flip over so it is breast side up, liberally sprinkle with herbs and a bit more salt. Slip into preheated oven and cook 50-55 mins, or until it reaches an internal temp of 165 degrees in the thickest part of the let or 150 degrees in the breast, since ever oven is a bit different. After 20 minutes of cooking add the mushrooms and chilies so they are finished at the same time as the bird. 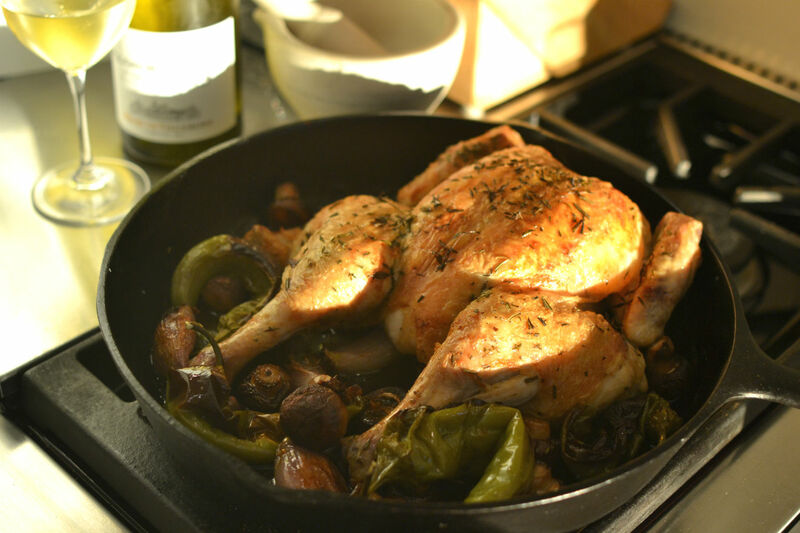 Remove skillet from oven, place chicken on cutting board and let sit at least 5 minutes before carving. Trader Joes has the shishito peppers. I look forward to trying this recipe. Teresa, I am on my way there now! Thanks.